Blogger's Note: This post was originally published in September of 2009 and was updated in November of 2015. Some of the links in the updated post are affiliate links. Clients often ask me how to organize items that are "just passing through" their homes. You may have seen "transients" like these in your home: the library books that need to be returned, the sweater that you need to mail to Great Aunt Myrtle for her birthday, the DVD that you borrowed from a friend and need to return, or that pair of Goodwill-bound go-go boots. Here's a simple, cost-effective storage solution. It won't win any awards for good looks--just keep it tucked in a closet or storage area--but it gets the job done. Start with a set of 4 wire storage cubes. The ones pictured here were purchased in 2006 for around $15 at Target. Amazon currently sells this similar set made by Whitmor for around $22.50. Most discount retailers offer some version of this product. 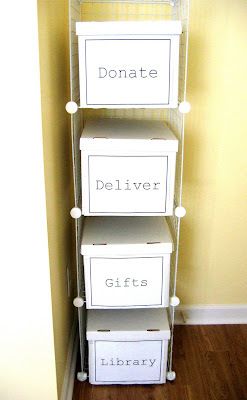 Add some economy weight banker's boxes (these are one of my favorite organizing tools). When I originally published this post in 2009, Staples was selling these economy weight boxes in a 6 pack, but Staples currently only offers them in a 10 pack. Amazon currently sells this similar product in a 4 pack for around $11. The Staples boxes offer the advantage of plain, white sides, though this feature may be irrelevant if you are tucking this shelving into a closet. Next, add labels. A fun idea would be to use chalkboard contact paper. If you want to keep things simple, copy the labels that I made here. I just used 8.5 x 11 paper with a 6 point page border and a 150 point "Courier" font. Finally, use the boxes to store stuff! In my home, the "Library" box holds library books to return and also magazines to be donated to the library. The "Gifts" box holds gifts earmarked for a specific recipient in addition to generic "hostessy" gifts like candles. "Deliver" is for post office items, store returns/exchanges, and items that I need to deliver to friends. "Donate" is pretty self-explanatory; when the box gets full, items in the box get donated. Given that "out of sight" items can be "out of mind", I'd recommend that any time-sensitive items be noted on your to-do list. Examples would be a store return that must be made within 30 days, library books with a looming due date, or a gift that must be mailed by a certain date. Need more storage? Use chrome shelving and labeled laundry baskets! Since this tip works for me, this post has been linked to lots of other organizing posts at Works for Me Wednesday. This DIY project has also been linked to other great DIY projects at A Soft Place to Land.